Final Fantasy The Spirits Within: The year is 2065. A meteor has crashed into Earth unleashing millions of alien creatures who roam the earth, decimating field and city alike, threatening to extinguish life itself. Prepare to be spellbound by an amazing woman, the brave individuals at her side and an astounding mission to save the Earth - all in cutting-edge CGI! Final Fantasy VII - Advent Children Complete: When a mysterious illness is.. The year is 2065. A meteor has crashed into Earth unleashing millions of alien creatures who roam the earth, decimating field and city alike, threatening to extinguish life itself. Prepare to be spellbound by an amazing woman, the brave individuals at her side and an astounding mission to save the Earth - all in cutting-edge CGI! Special Features Animation Director, Staging, Director And Editor Commentaries, Character Profile Featurett..
Own Final Fantasy - The Spirits Within / VII Advent Children / XV - Kingsglaive DVD from Deff, DVD, Blu-Ray & 4K Video Specialists - Free UK Delivery.. The year is 2065. A meteor has crashed into Earth unleashing millions of alien creatures who roam the earth, decimating field and city alike, threatening to extinguish life itself. Prepare to be spellbound by an amazing woman, the brave individuals at her side and an astounding mission to save the Earth - all in cutting- edge CGI! Special Features Animation Director, Staging Director And Editor Commentaries, Co-Director And Crew Commen.. 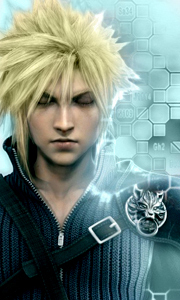 When a mysterious illness is linked to an insidious plot to resurrect an old enemy, Cloud is forced to take sword in hand if he’s to save the planet once again. Featuring an extended director’s cut containing 26 minutes of explosive new footage and over 1,000 revised scenes, Final Fantasy VII: Advent Children Complete is Blu-ray Disc High Def at its mind-blasting best, a senses-shattering CGI sci-fi adventure you can’t afford to miss! .. The magical kingdom of Lucis is home to the sacred Crystal, and the menacing empire of Niflheim is determined to steal it. King Regis of Lucis (Sean Bean) commands an elite force of soldiers called the Kingsglaive. Wielding their king's magic, Nyx (Aaron Paul) and his fellow soldiers fight to protect Lucis. As the overwhelming military might of the empire bears down, King Regis is faced with an impossible ultimatum - to marry his son, P.. The magical kingdom of Lucis is home to the sacred Crystal, and the menacing empire of Niflheim is determined to steal it. King Regis of Lucis (Sean Bean) commands an elite force of soldiers called the Kingsglaive. Wielding their king’s magic, Nyx (Aaron Paul) and his fellow soldiers fight to protect Lucis. As the overwhelming military might of the empire bears down, King Regis is faced with an impossible ultimatum – to marry his son, P.. Continuing the storyline based on the hit Playstation game Final Fantasy VII, two years have passed since the ruins of Midgar stand as a testament to the sacrifices made in order to bring peace. However, the world will soon face a new menace. A mysterious illness is spreading fast. Old enemies are astir. And Cloud, who walked away from the life of a hero to live in solitude, must step forward yet again... Special Features Reminiscence ..